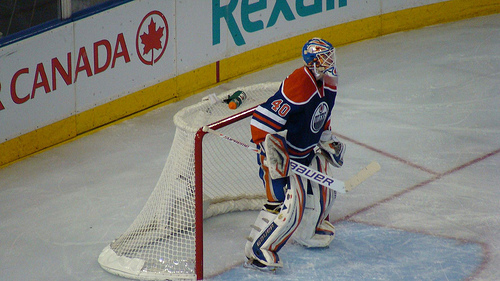 Edmonton Oilers #40 Devan Dubnyk, Photo taken by Kaz Andrew in 2013. Boston Bruins at Edmonton Oilers December 12, 2013 in Rexall Place, Edmonton, Alberta. The game begins at 9:30pm eastern time. This is the first of two games these teams will play against each other this season. The next game is Feb. 1st, 2014. Boston Bruins (21-8-2) is on a 3 game winning steak, won 7 of their last 10t games, and won 8 of 13 games on the road going. Against teams with a losing record the Bruins have won 6 out their last 7 games. The key player tonight for Boston will be the goalie, Tuuka Rask. He’s holding a 16-7-2 when starting for the Bruins, 1.87 GAA and .935 SV%. Edmonton Oilers (11-18-3) are 5-9-1 at home, having a hard time getting things stable with a record of 6-3-1 in their last 10 games, and playing against a team with a winning percentage above .600 the Oilers records is 1-5 in their last 6 home games. Edmonton will need Devan Dubnyk to step up his game tonight. Devan Dubnyk record when starting the game for Edmonton is 9-12-2 with a 3.27 GAA and .892 SV%. These teams don’t meet often, however, when the Oilers and Bruins go up against each other. It’s the Bruins who come out on top. Winning 10 of the last 11 games they played and 4 straight in Edmonton. To find the value in this game, you will have to place your bet on -150 (Boston Bruins) with the moneyline or 2/1 odds the Bruins will win in regulation time. My prediction is the Bruins will win this game 3-1. However, I risk 1 unit taking 2/1 odds on Boston winning in regulation time and 1 unit with the moneyline that Boston Bruins will win this game.